There’s a lot of horrible design out there. Walk down any high street, look in any magazine or visit your doctor and look on the wall in the waiting room. There are a lot of things that have made it to print that are a crime to aesthetics and good taste. Sometimes this is down to people not caring. Sometimes it’s down to people thinking they can just ‘cobble it together’ themselves. And sometimes because, whilst people know it needs to look good, they can’t afford to have it designed professionally. There are times when I get requests from people in this situation. A few times a year I help out good causes by offering design for free. If it’s something I believe in and care about I’m happy to do my bit for The Big Society™. 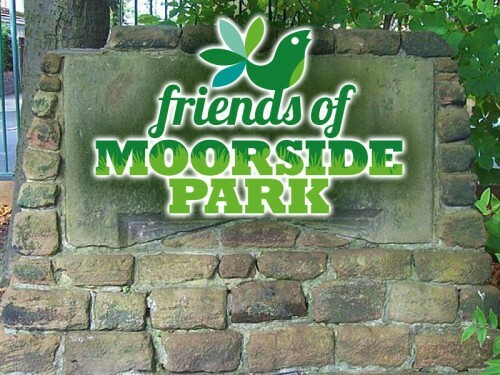 Recently I was approached about helping develop a logo for a local community group of volunteers called “Friends of Moorside Park”. I care about the environment and our green spaces as much as I care about ridding the world of ugly design so it was my social duty to step in and do my bit. It makes me feel a bit better and they now have a lovely little logo that they can be proud of. Job done. Thank you again on behalf of our group, the logo looks fab – everyone loves it and we have already had some positive feedback on it! !